As we began this journey, we had a desire to learn to fish. For me (Marc), I grew up fishing bass in ponds and then up in Canada in Lake Erie but it was something I did occasionally and wasn’t very good at. 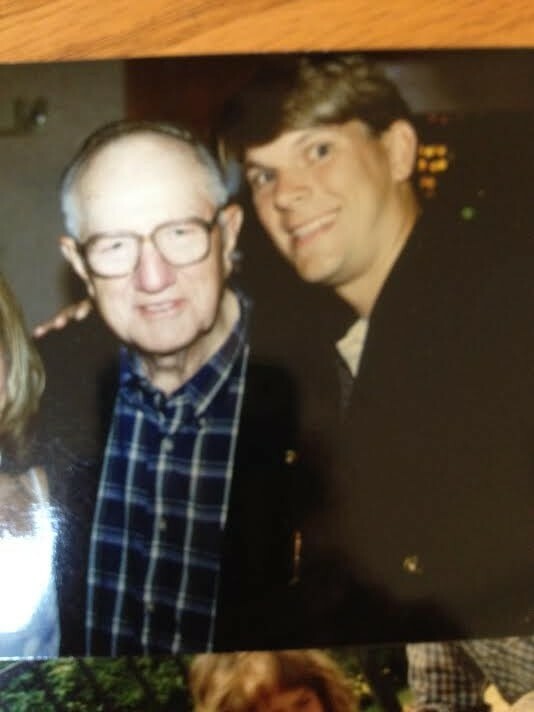 My Grandpa Joe found such joy in it and was a darn good fisherman. I know that Camden and I have found that love of fishing that Grandpa had. 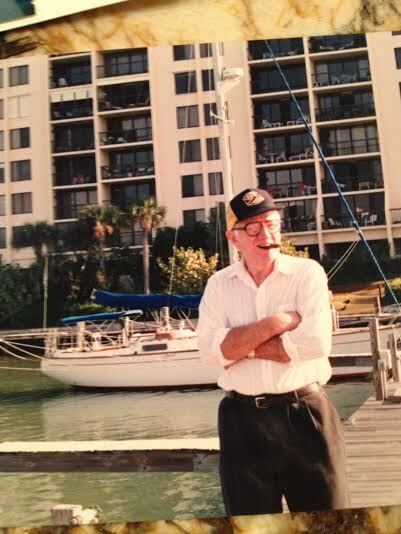 I think of Grandpa smoking his cigar, fishing and sending us his wisdom every time that I put a line in the water. One of Grandpa’s favorite lines was “put that in your pipe and smoke it” after he gave some sage advice. One of Camden’s favorite lines (that he made up) is, “Dad, let me know when you hear that sweet sweet sound singin’ off the reel.” Now that is a classic line. Cam’s excitement started back when we were sailing in Indiana and he fished at Lake Monroe. This continued as his Uncle Dan bought him his first real fishing pole. Then in January we moved to Florida and for us novices, we started out buying some additional poles and tackle at a local store. 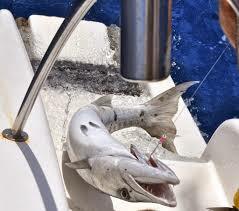 Saltwater fishing is really defined as either bottom fishing or trolling. 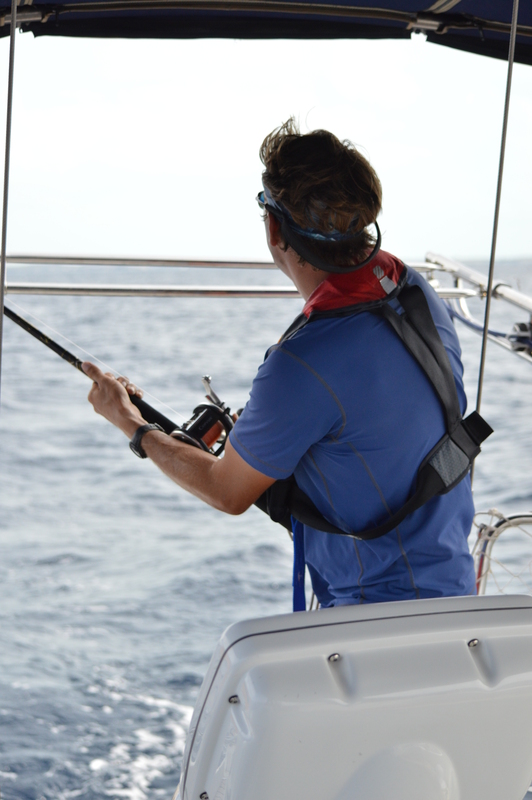 Bottom fishing is stationary and done off a non-moving boat, beach or pier while trolling is typically done dragging a line behind a boat moving around 6 knots. (Check out this link for more info). 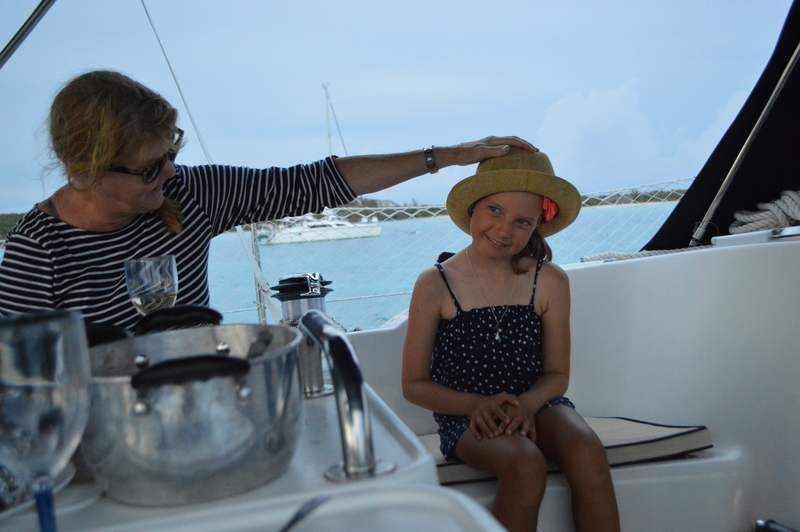 Our intent was to fish as we sailed from Florida to the Bahamas; however we were so busy with the sailing and figuring out how to work as a family on the boat, we didn’t get the lines out. 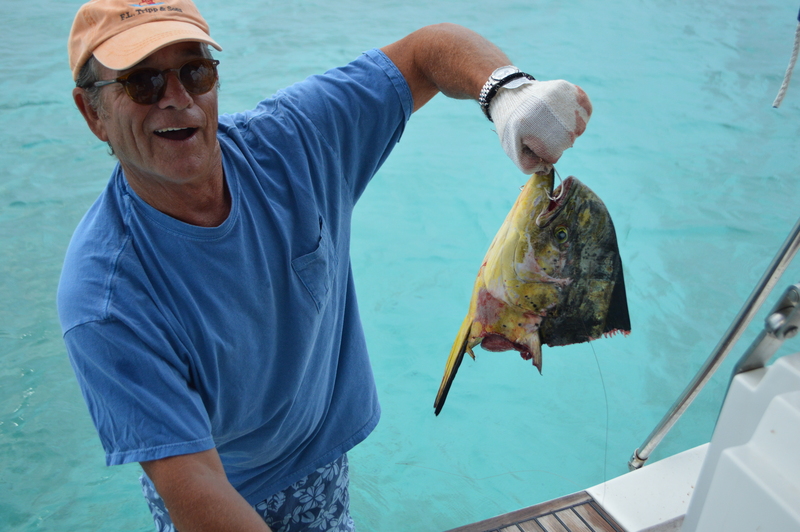 In Bimini, Cam found an immediate friend in Pierre and as Jen wrote in our Bimini blog he led us in a Fishing 101 class. Nothing like learning from a 9 year old. This led to Cam catching many Irish Pompanos and for the first time, filleting and eating what he caught. During the sail from Bimini to Nassau we had our first big fish on and I made the rookie mistake of releasing the break on the trolling rod which caused the spool to run free and caused what fisherman call a hornet’s nest. The short story is that I was not able to reel in the fish. We tried to use the winch on the sailboat but the line was too tight and the fish broke free. 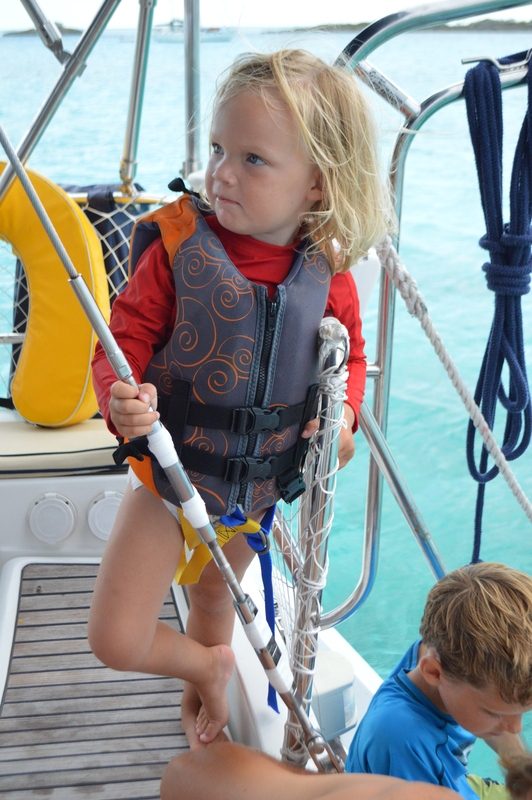 We replaced the line in Nassau and again tried to fish during our next sail. This time, we did everything right but had too large a fish on the line. 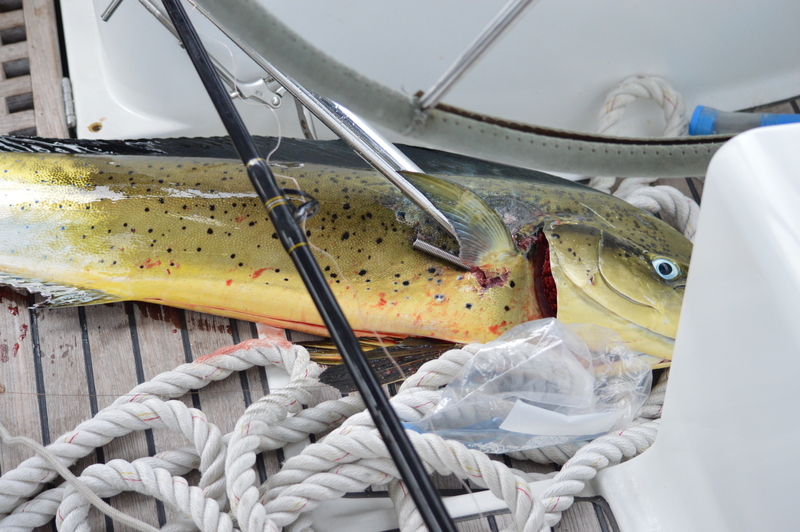 We have a 50 lb test line on our trolling pole and this fish snapped that line so it must have been huge. 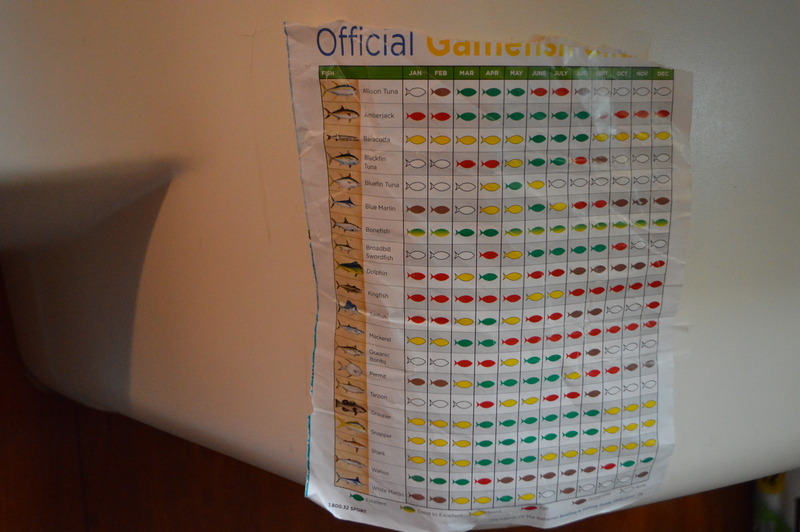 Cam of course thinks we must have had a shark on the line. So, we were on to try it another day. 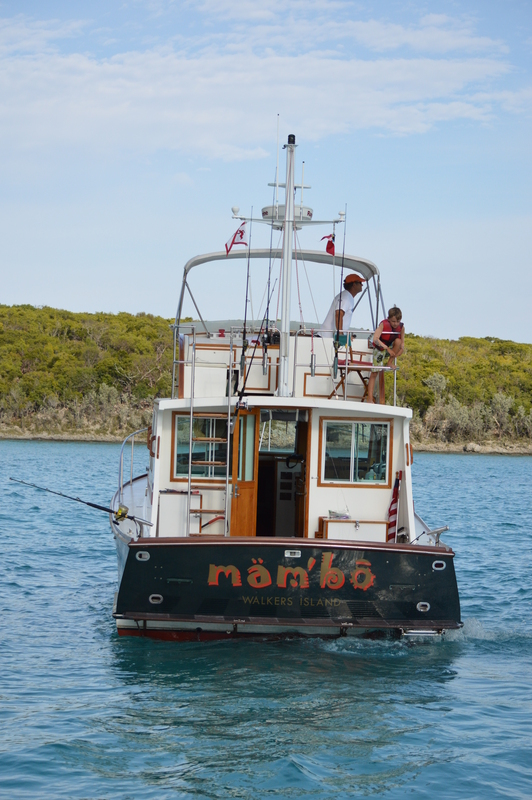 We then fished on Chip’s motor boat, Mambo (friends from Fort Lauderdale) but to no avail. 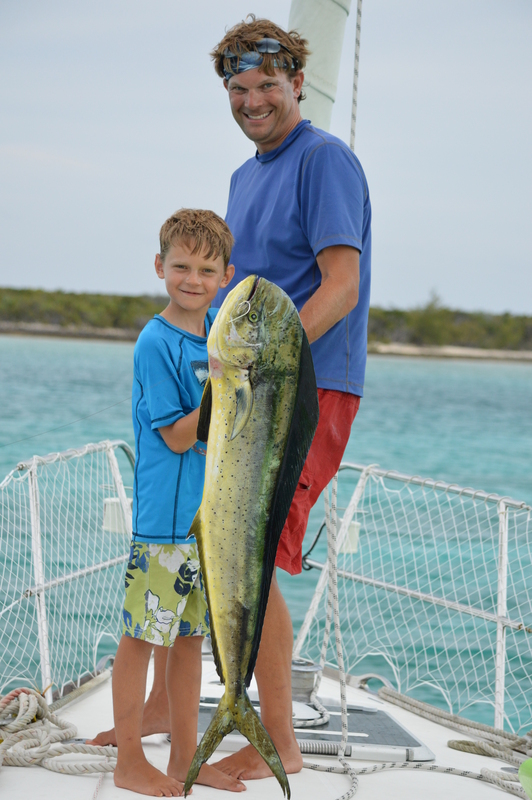 Cam continued to fish often and catch many small fish throughout our trip but the big one still eluded us. His patience through this time was neat to see and Jen and I have been surprised at how Cam never got frustrated. All Cam talks about from the minute he wakes up to the minute the sun goes down is fishing. 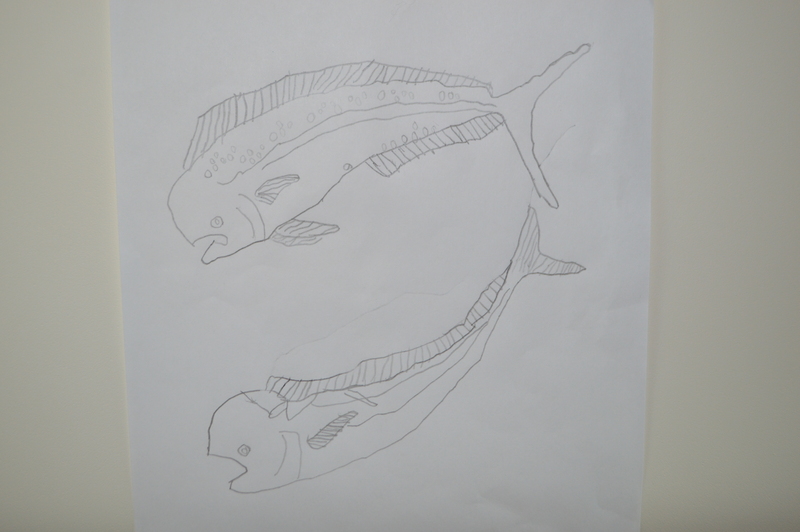 Cam has decorated his cabin with fish charts and drawings he’s sketched of fish. We finally landed our first large fish last week and Cam’s face was priceless and I was really excited. 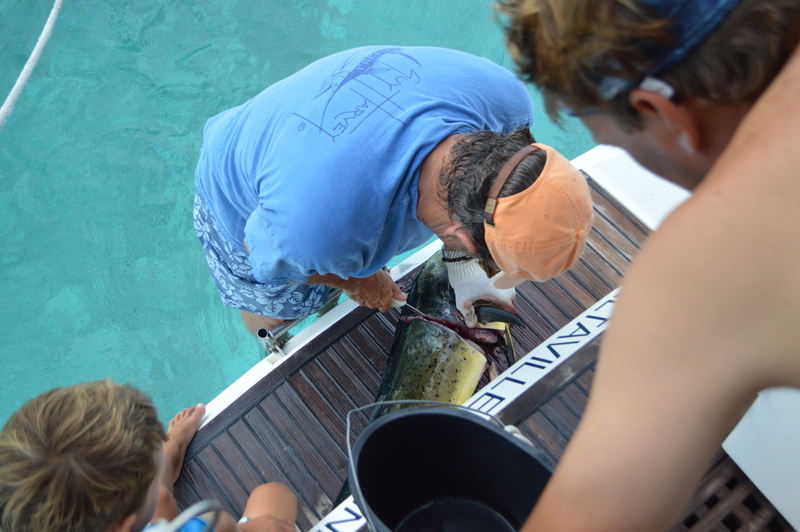 We landed a 4.5 ft Mahi Mahi and it took nearly 45 minutes to bring the fish to the boat. 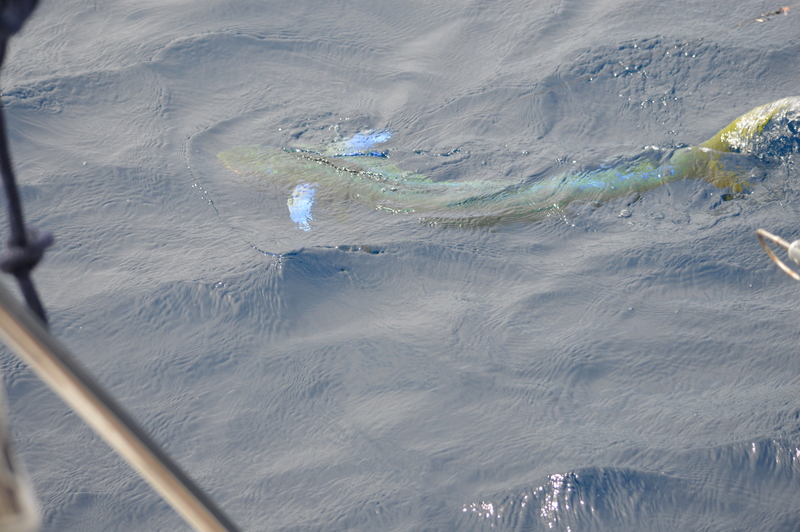 Joellen was the first one to see it jump and called out that we had a Mahi Mahi on the line. Currently, I am reading Ernest Hemingway’s, The Old Man and the Sea and he writes about a similar experience. 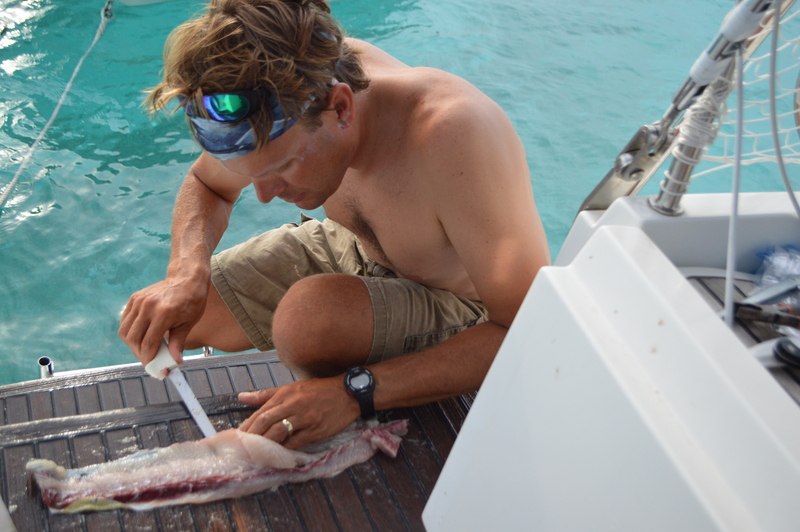 Once we pulled the fish up on deck and dropped the anchor, we had Chip come over to partake in the filleting activities. Chip, Cam and I were like three little kids in a candy store. We ate the Mahi over the following few days but that fish the first night was probably the best that I have ever had in my life. We were all so excited at dinner that we must have done 6 or 7 toasts to the fish, Camden, the ocean, our fishing rod, etc. Two days ago, we thought that we had either a tuna or grouper on the line and were excited to have another big fish to eat. 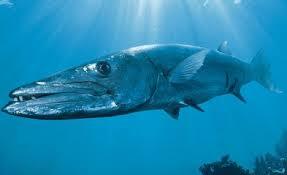 I guess we got a bit ahead of ourselves because unfortunately it turned out to be a 3 foot barracuda. We brought it to the boat and then I released it since I didn’t want those sharp teeth aboard and it’s not a very good fish to eat. So, like my Grandpa Joe said, you need to have a line in the water if you want to catch a fish. And now that our confidence on how to sail the boat as a family is high, we almost always have a line in the water as we move from place to place. Adagio, Adagio, Mambo standing by on ch16, how I miss that chatter ! Great photos , great friends, great locations, GREAT FISH ! We miss the crew of Adagio. Wee Willie misses the fun, as we all do. Next year God willing. Mambo, Mambo…Adagio. Let’s switch to 14. Mambo, Adagio here on 14. Let’s have another fantastic day of fishing, snorkeling at the grotto, walking Willie on the beach and having drinks in the cockpit. Roger that. Adagio going back to 16. I showed this blog to Uncle Dan and he was pretty excited for you guys. Said he can’t wait to fish with you! Pretty incredible. Those pictures of fish are like the ones you see in seafood restaurants! Very cool. Great story and pics! That thing is as tall as Cam Man! Hey guys-congrats on the big fish! That’s really cool and awesome you are now dropping lines in as you sail…I read all your posts and always enjoy hearing how you are doing. Marc-it was great talking to you yesterday! As is said ‘a picture can say a thousand words’….we all love the pics-you look healthy, happy, and fulfilled! Safe travels. What a wonderful story. Love reading how all of you start a project and never give up. Miss seeing all of you but reading the blog keeps us all connected. Big hugs and kisses to all. Wow! 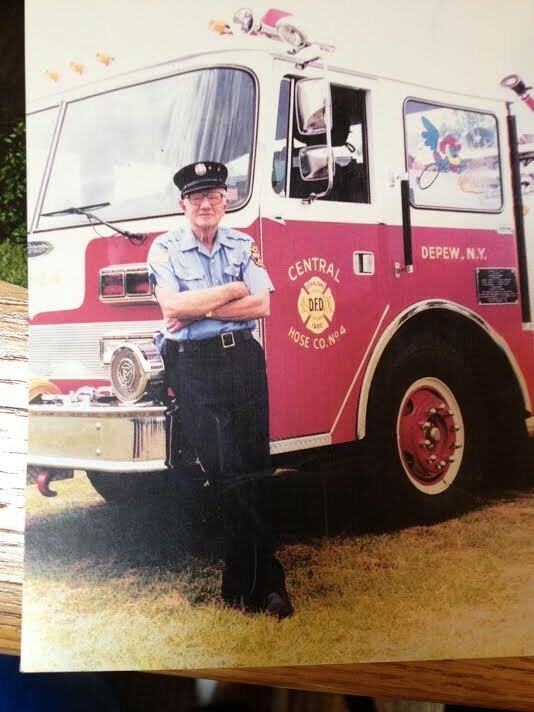 Great story and pics! Congrats Cam and Marc on the big catch. Fish stories are always better when you actually get to eat the fish. Miss you all. Miss you as well – All my best to you and your family. Thanks for the guidance on how to write a blog. Jen and I learned much from you on blogging and many other aspects of life. 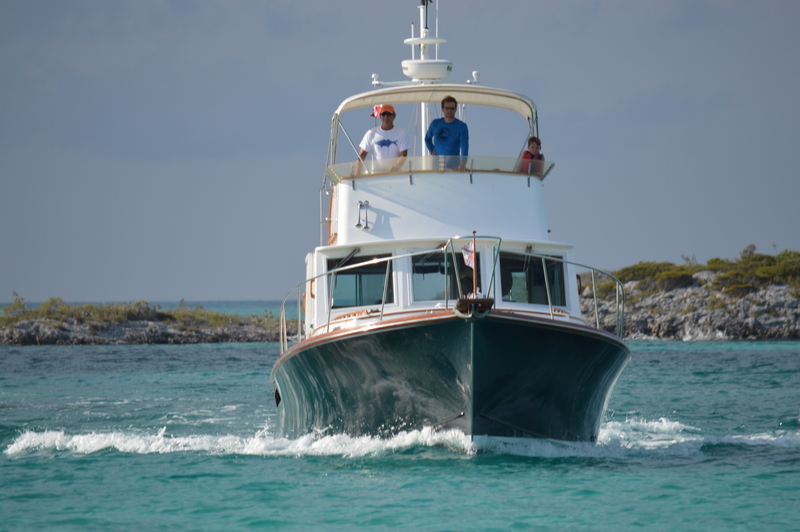 Marc you are starting to look more like the “Salt Life” image….I like it! Too funny – I will tell Cam that he is on for “fish school” with Uncle Jeff. You guys need to figure a way to make it down here either this year or next. We would love to have you and you guys would love it here. Oh my CAM!!! How very exciting!!! I got so excited as I read the story of your big catch! I could not believe the picture of your fish, it was amazing! It is amazing how much more fun things are when you see them through the eyes of your own children! This was a tale well told! I could feel it on the page! Love you Mary P. I’ll show your comment to Cam tomorrow. He thinks you are so cool. Those pictures are seriously PRICELESS! 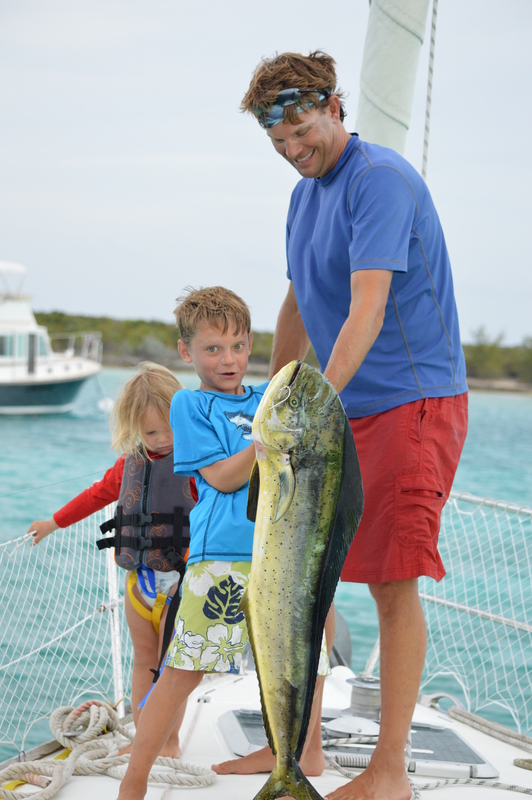 Thank you for sharing your fishing story – I loved hearing it! Hi this is Andreas dad (we meet at Andrea and Barrys wedding). I have sailed all of my life and I really enjoyed reading your posts. I think I’m living your trip vicariously. Congratulations on the gift you are giving your children and each other. Thanks Tim. So great to hear from you. Hope you are well.